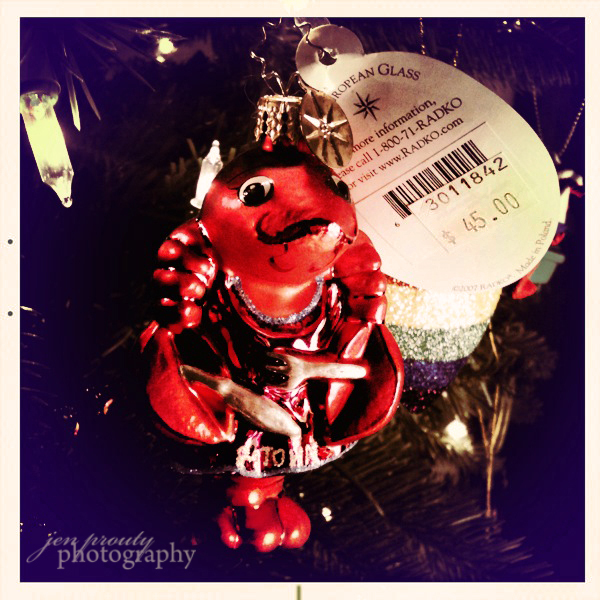 Today's ornament: $45.00 lobster. Story: Every year on our annual vacation, I always like to pick up an ornament that will remind us of that year's adventures. Summer 2009: We rented a cottage in Provincetown at the tip of Cape Cod. Long story short (well short for me whatever that means! )...we were doing some shopping one day. Shopping is to be defined for this story as me darting in and out of the stores at superhero speeds while Pat tries desperately to entertain Jamerson, then 18 months, and keep him from climbing out of his stroller and escaping. I stumbled upon the mega-Christmas-ornament store. The Bronner's of Cape Cod. I am in heaven. My pace slows down as my eyes wander across the twinkly, brightly colored, walls of ornaments. What to buy, what to buy. I am lost in thought when suddenly, reality comes echoing through the store in the form of an 18 month old's tantrum outside the door. I glimpse through the window and see the desperation in Pat's eyes as he realizes the DVD player (our personal, traveling nanny) has run out of battery power. There is no time to linger....we are on the verge of getting thrown off Cape Cod if we don't get this child home for a nap. I go up to the counter and see this little display of glass sea creatures. I spy this cute lobster that says P-Town on it. Perfect. I'll take it. I have the guy wrap it up and hand him my credit card, not bothering to look at the price. I saw the starfish was $12.00 so I was sure the lobster was the same. I sign the slip, grab my bag, and race out the door to relieve Pat. As I tuck my receipt in my wallet I stop dead in my tracks. "What is it?" Pat says as he peers over my shoulder..."They overcharged you...go back in and have them fix it"